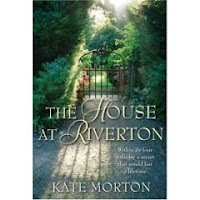 It’s with a sense of loss that I finished reading The House at Riverton. I felt as though I’d now lost contact with the characters and the worlds they inhabit. I say worlds because this novel is split into two time zones, so widely different in all aspects that they could be separate worlds. The novel opens in 1999 (reminsicent of Du Maurier’s Rebecca) with Grace’s dream of the night in 1924 when Robbie Hunter, a poet, committed suicide at Riverton Manor. Grace’s memories are revived after Ursula, an American film director who is making a film of the suicide had asked for her help as the only person involved who was still alive. Grace had worked for the Hartford family during the period 1914 – 1924 , first as a housemaid at Riverton Manor house, then in London as lady’s maid to Hannah, one of the Hartford sisters. The social life of the upper classes during the Edwardian period is the setting for this part of the novel, vividly bringing it to life and contrasting with life and society in the 1990s. The secrets concerning both Grace’s past life and her relationship with the two sisters, Hannah and Emmeline are told in a series of flashbacks as Grace records her memories on tape for her grandson, Marcus (and there is a mystery surrounding Marcus too). This is a richly descriptive book, well located both in time and place, indentifying the differences in the social classes in 1914 on the eve of the first world war and the immense changes that followed. The characters are well-drawn and believable. The tension and the pace of the novel held my attention throughout, so much so that I had to concentrate on reading just this one book, instead of picking up several as I normally do. This is a book about strong characters, about families and relationships within the family, particularly between sisters; about privilege; effects of war and change within society; and there is a mystery as well. Definitely a book worth reading. I am so ready to read this book. I looked and it won’t be published in the US until next spring. I’ll have to look for it then. It sounds lovely! This book has been in my consciousness for awhile now – and I’ve been wanting to read it – your review is so thorough without giving anything away. I am really looking forward to this one – not sure if I’ll wait for the US pub. date or use book depository. Kay, it’s a long time till next spring, so I hope you don’t forget about this book as it is good.Tara,thank you. It was quite difficult not to reveal what happens and yet give an idea of what the book is about.I hope you both enjoy this when you can get a copy. This book sounds great. I’ll be sure to add it to my TBR list. And Rebecca is one of my favorites (loved the old classic movie too)! I have been reading this everyday at lunch. It would be so easy to just lay on the sofa and read it straight through–no doubt I would given the chance! She does tell a good story and I am veyr curious how things are going to work out! (Thanks for not giving away spoilers by the way!). Here I am, again, and I wanted to thank Tara for mentioning the Book Depository and of course, you BooksPlease for mentioning The House at Riverton. I went over there and not only bought this book, but put a few that had been in my amazon uk basket on the list, so now I’m some dollars poorer, but oh, so happy. What a great thing BD is. No shipping cost which is what made up the biggest cost when ordering from amazon uk. Now, I’m really in trouble! Laura, welcome – Rebecca is one of my favourites, too.Danielle, I’m so glad you’re enjoying this book, I read it mainly in the mornings – in quite long sessions now that I have the time!Nan, thanks for your comments. I’d forgotten about the Book Depository. It’s great that there are no shipping costs! Previous Previous post: Books To Be Read?